Not even a broken nose could deter Guiseley Vixens’ match winner, Ellis Casper, as she shrugged off the injury to score the decisive goal in their 1-0 victory at Fylde, writes CONNOR CRAIG-JACKSON. 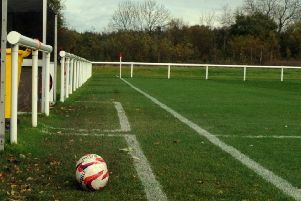 The goal – that ended a run of four FAWPL North games without a win – came after a cagey opening 45 minutes, with the win timely ahead of their mouth-watering West Riding County Cup semi-final with city rivals Leeds United next week. The Whites also rekindled their winning form, with their huge affair on the Elland Road turf seeing Emma Lee put them ahead against Morecambe within five minutes. Leeds dodged a bullet on 18 minutes after Yasmine Swarbrick missed from five yards, however the home side picked up a deserved 1-0 victory to move up to fourth in the FAWPL Division One North. Brighouse remain one place above Leeds after their spirited fight-back earned a 2-1 win at Newcastle United. Town went 1-0 down early on after a defensive mix-up gifted the hosts an opener through Abbey Joice but, just over 10 minutes later, Charlotte Proud found Lavinia Nkomo who found the back of the net to level for Brighouse. A sublime second-half free-kick from Charlie Blythe then put Town in the lead, proving the winning goal for the Orange Army to make it nine league games unbeaten. One unbeaten run did come to an end however for West Riding Premier Division leaders Hepworth United, who suffered a shock 3-1 defeat at Middleton Athletic, who leapfrog Silsden off the bottom of the table. Hepworth remain top but could still be caught by Yorkshire Amateur, who are sitting eight points behind with three games in hand. The First Division saw Tyersal edge Dewsbury Rangers 1-0 through Abbie Tate for a third successive victory, while Dewsbury still face a nervy finish to avoid relegation. Second Division champions Farsley Celtic Juniors saw their perfect league record rumble on after a 4-0 win over Thackley Reserves. The fight for the runners up spot meanwhile saw Ossett United grab a big 4-1 victory at Leeds United Development to leapfrog them into second. A player-of-the-match performance from Jodie Clarkson saw her grab a brace, with Georgia Sykes and Charlotte Gough also scoring for Ossett to overcome Katie Breckin’s impressive free-kick for Leeds.